This shows you what you can get with the Nifty tools and gives summarised instructions to get them for yourself. It’s a work in progress, so expect more and more to be added as time goes on. So choose which one you want and find out how to get yours. This is intended to be tweeted so your friends, family and faithful followers can easily give you a boost. They do it by first tapping / clicking the image in the tweet. 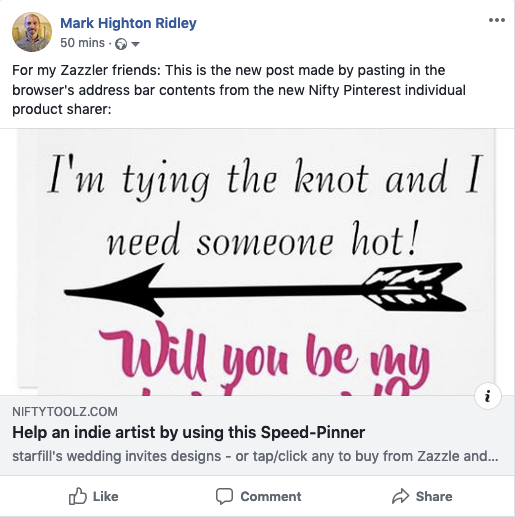 That takes them to the speed-pinner and that, in turn, lets them pin your designs on their Pinterest boards. There’s nothing hard or complicated for them to do, they just have to tap/click and choose their Pinterest board. And repeat until they feel they’ve done enough. Use Step 1 in the Nifty Promo Control Panel as usual to get the products you want to feature. 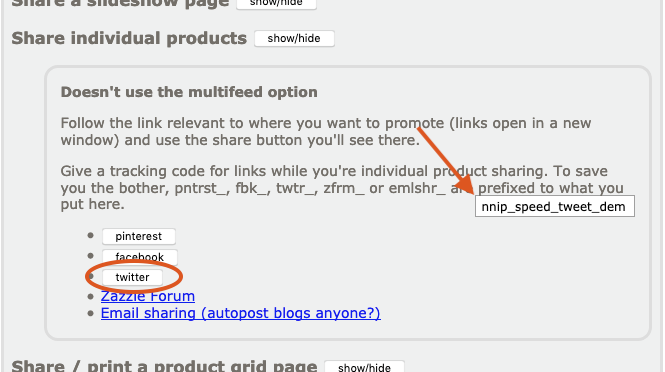 In Step 2, choose the Individual Product sharer for Pinterest. Don’t forget to set the tracking code! 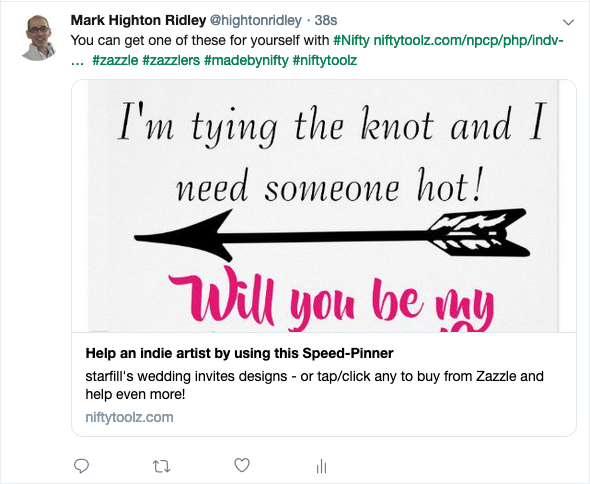 When you click the button and the Pinterest individual product pinner page opens, you need to copy what’s in the address bar – because that’s what you’ll be pasting in your tweet. It’s what makes the magic happen. Now you have the address bar contents copied, start a new tweet, type your message with hashtags and then paste the almighty long gibberish you copied. You can do exactly the same thing when replying to someone else’s tweet. How cool is that? 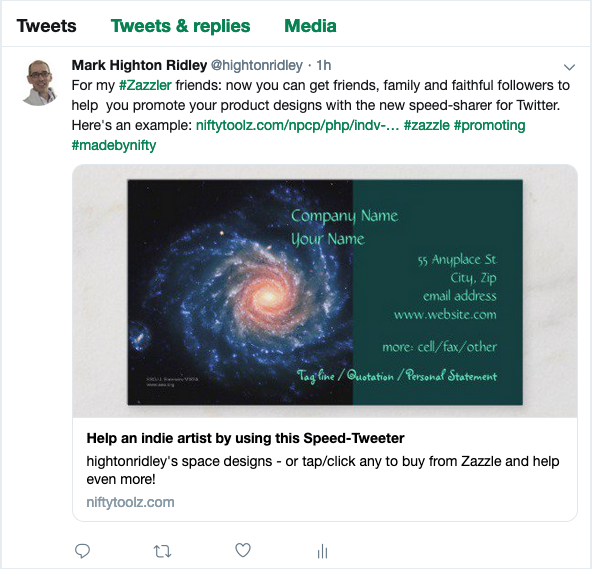 This is so you can tweet (or reply to a tweet) with a speed-tweeter aimed at getting you help with promoting your work. In your tweet you ask / @mention your friends, family, etc. 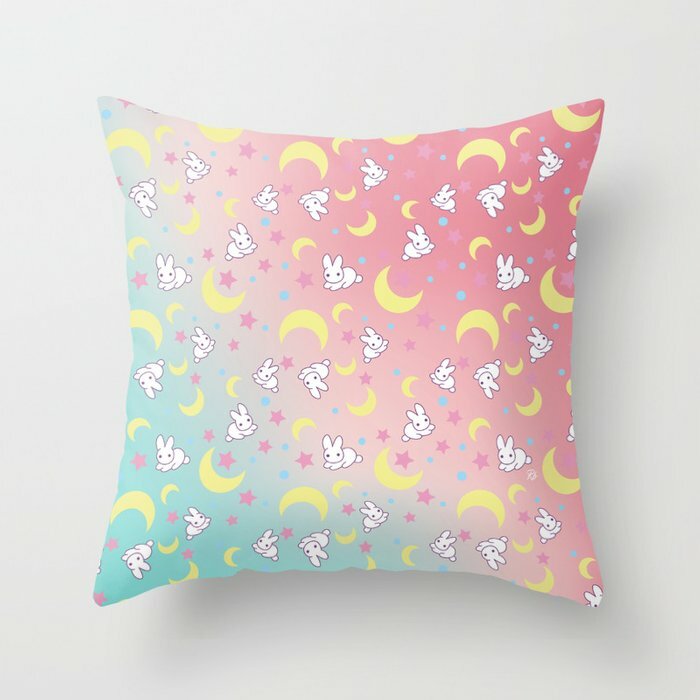 to suport you by rapidly tweeting your featured product designs. It’s so easy for them to do, you should get lots of traction. don’t forget to set a good tracking code! 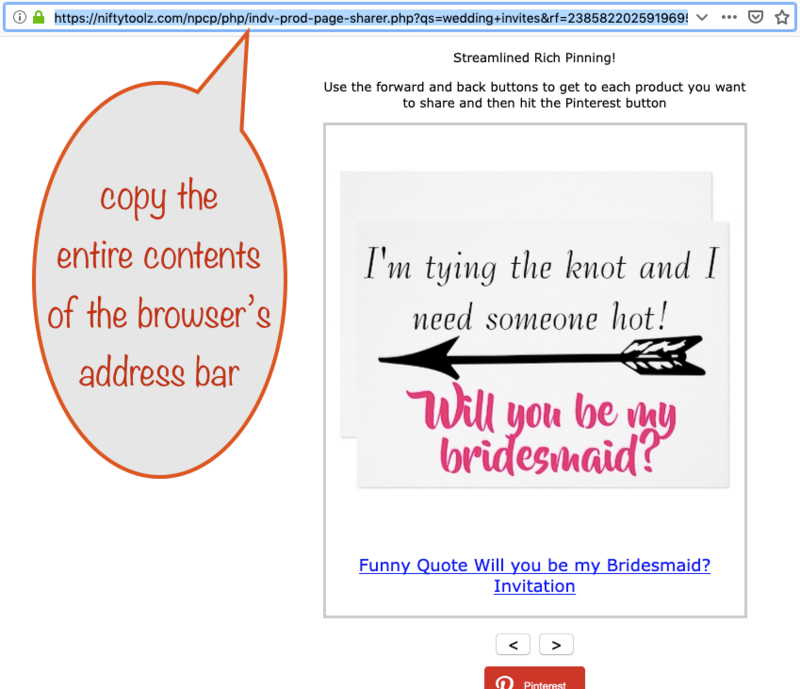 Follow the same process for copying the address bar contents of the page that opens, as per the Speed-pinner, above. Next, start a new tweet (or reply to an existing one) and ask for help in tweeting your featured products. Then paste what you copied and you’ve got your tweet all ready to send! 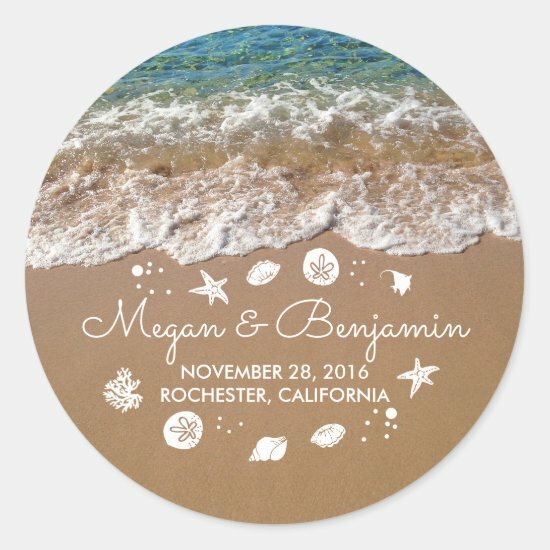 These are a great way to show off your designs in a blog post or a page on your site. In the Nifty control panel, set up the products you want to feature. 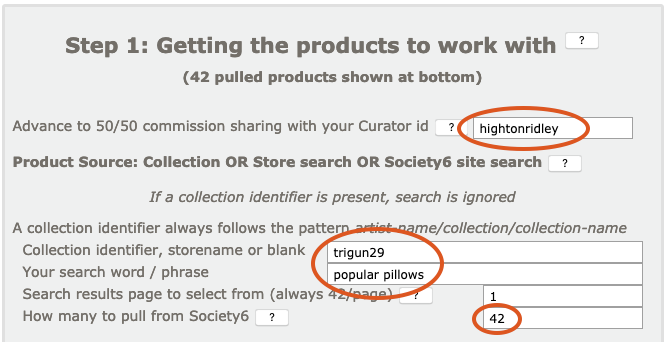 Set a small “number of products to request” so you don’t overwhelm your page. 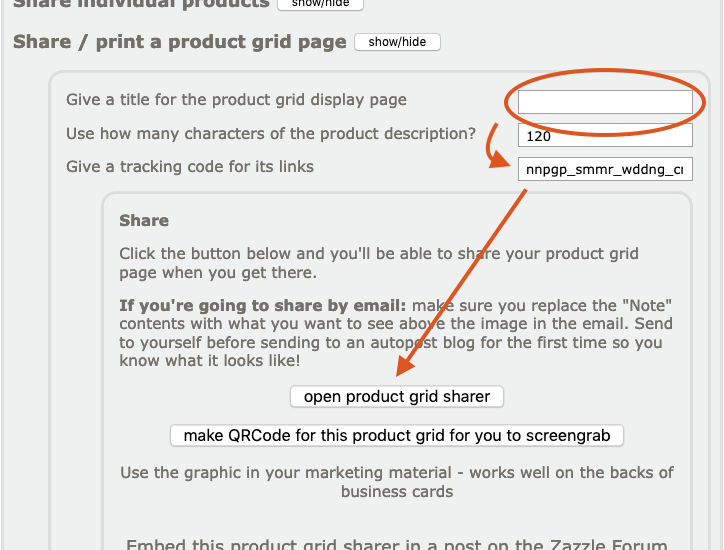 After you’ve done that, in Step 2, choose to open the product grid sharer page. When space is tight, leave the title blank. Do make sure you give a decent tracking code before clicking the button. When the product grid page opens, scroll to the bottom to see the button to get the code. Give it a click to reveal the code and then hit the copy button. 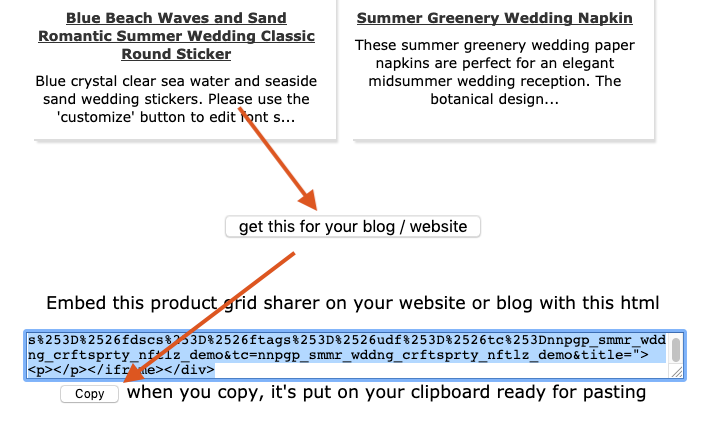 You’ve now got the html ready for pasting into your website or blog. If you want to change the height or width, they’re mentioned in two places and both need to be changed (it’s an older browsers thing). If you’ve dabbled with html before you’ll have no trouble. Most people will be happy with the defaults given. When you want something eye-catching – an embedded slideshow is great for holding a visitor’s attention on your products. As usual, start with setting up the products you want in your slideshow in Nifty Step 1. Leave the default of 42 for the number to request for your slideshow or even reduce it some – 30 is a good number to use. 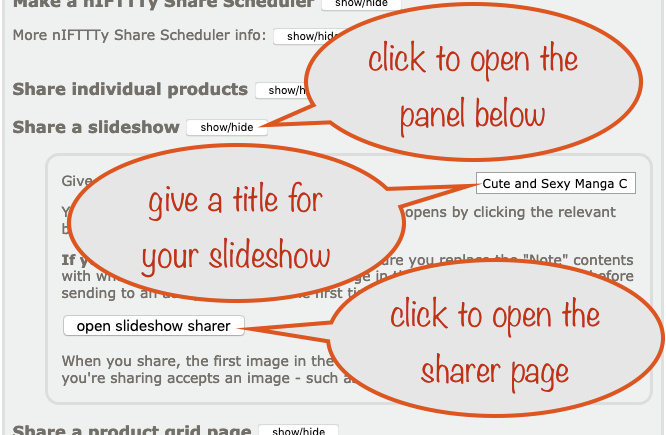 Next, in Nifty Step 2, give a title for your slideshow and then click the button to open the slideshow sharer page. That’s where you get the embed code. …scroll to the bottom and click the button you’ll see there. 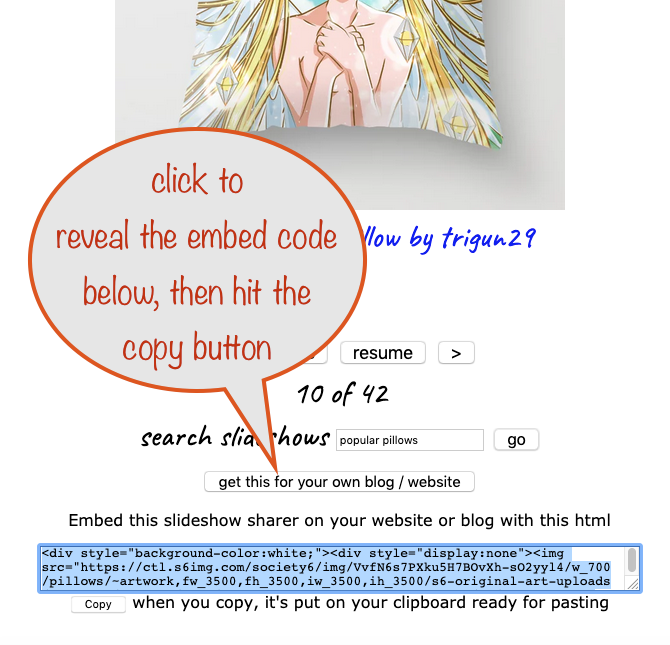 Your embed code will then be revealed for you to copy and paste into your website or blog.